It sometimes surprises visitors to an airport tower just how visual the job is. Controllers in the Visual Control Room are physically looking at the aircraft they’re guiding, with minimal use of radar. The clue is in the name, I suppose! But during periods of bad weather such as fog, like parts of the UK are experiencing today, the rest of the airport can become completely invisible from the tower. In these circumstances control has to switch to radar and ‘low visibility procedures’ to ensure airport operations can continue safely. These special procedures cover aircraft on approach and departure, as well as movements on the ground. 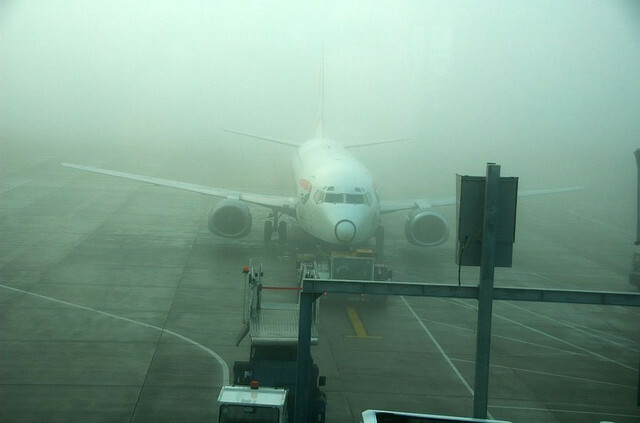 In foggy conditions, aircraft use the Instrument Landing System (ILS) at the airport to be automatically guided to the runway – they are effectively following the ILS beam all the way to touch-down. It is therefore important that we protect the beam from any interference, such as from other aircraft on the runway. This means spacing between aircraft has to be increased, with an aircraft having to touch-down and taxi far enough away from the runway such that it no longer interferes with the ILS beam before the next one can be given landing clearance. Typically this means the spacing between aircraft has to increase by up to 50%. Aircraft are also more widely spaced when manoeuvring or taxiing, whether they’re arriving or departing. All this takes extra time, effectively taking capacity out of the airport with the end result often being delays to passengers sitting in the terminals. Whenever there’s bad weather we work very closely with airlines and airport operators to handle safely as many flights as possible and minimise the disruption. As ever, if you’re concerned about the effect bad weather might have on your flight, you should contact your airline which will be able to provide you with the latest information.